At the end of September, our lives were forever changed when my husband got out of the Marine Corps after 11 years. I can tell you from personal experience that this transition can be exciting and scary, and well...just overwhelming! And I'm only the wife! Though things are starting to settle down a bit here, the transition out of the military can certainly be one filled with many questions. The biggest one being: What are we going to do NOW? 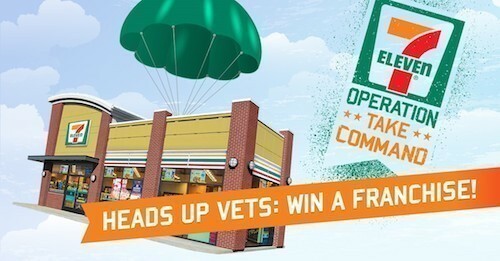 7-Eleven knows the hard work and dedication that our U.S. veterans have shown (their President and CEO, Joe DePinto, is himself a military vet) and have come up with a fantastic opportunity for one very lucky veteran...the chance to win their very own franchise!! If you are or know a veteran who could use a fresh new start after their military career has come to a close, enter for yourself or spread the word. Our military veterans have worked hard and deserve this fantastic opportunity. Visit OPERATION: TAKE COMMAND to learn more.